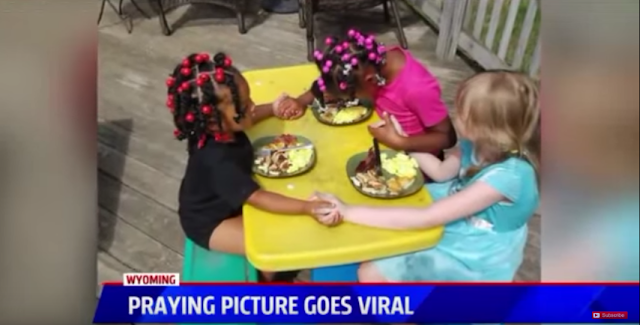 A beautiful picture was captured of three West Michigan girls praying before breakfast is going viral, receiving thousands of likes in the past week. Three little girls, wiser than their age said they were just doing what their parents taught them. Two of the girl’s ages 6 years-old and the other 3, are setting a big example for everyone showing us to be accepting and loving of each other regardless of our differences. The picture of the girls praying, Oriana, Grace and Alexis was posted on Facebook by Ruth Andrew (Oriana and Alexis’ mother) where it just took off. Receiving over 60,000 shares and viewed by millions, the families were shocked. When the parents told the girls that their photo was viewed by millions their reaction was priceless. They immediately yelled out, “What? !” and turned to each other in disbelief. I guess their mother’s lessons really got through to them. What precious little humans. Andrew says that it isn’t the cuteness of the photo that is touching many people, it’s the lesson that the girls are portraying. The biggest lesson to take away from these kids is to love one another regardless. We may come from different families, different regions, disagree on certain things but we should always be accepting and loving. The parents of the young children did a wonderful job raising them.